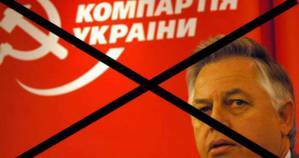 The Stalinist Communist Party of Ukraine ( KPU) has been banned, published here is a report by Halya Coynash of the respected Kharkiv Human Rights Protection Group. The Ministry reports that on the same day the Administrative Court of Appeal in Kyiv upheld the earlier rejection by the same District Administrative Court of a Communist Party suit against the Ministry. The Communist Party had demanded that the Justice Ministry revoke its Order from July 23, 2015. That Order stripped the Communist Party and two other linked parties of their registration, and therefore their right to take part in the coming local elections. As reported at the time, three Ukrainian political parties had thus effectively been banned from participating in elections without any court ruling. This act has now effectively been affirmed by two levels of administrative court, while the new ruling outlaws any activities of the Communist Party of Ukraine. The Justice Ministry asserts that “the above-mentioned court rulings will have positive consequences for all Ukrainian society”. This is not a view shared by many human rights activists and lawyers who believe the ban, and the law on which they are based, are likely to be slammed by the European Court of Human Rights. The July 23 Order cited the controversial Law on condemning communist and National-Socialist (Nazi) totalitarian regimes in Ukraine and on prohibiting propaganda of its symbols” as its justification for depriving the parties of their electoral rights. At the press briefing given on July 24, the Justice Minister Pavlo Petrenko asserted that an independent commission had been formed as soon as the law came into effect, with this including representatives not only of the Ministry, but of civil society The commission allegedly worked for a month and presented conclusions on the basis of which the Minister signed his decrees which state that the activities, names, symbols, charters and programmes of the three parties are against the law. There was no indication on the Ministry’s website as to who was on this commission and how “representatives of civil society” were chosen. The law in question does indeed ban the activities of any party that uses communist (or Nazi) symbols in their name or has propaganda of communist (or Nazi) totalitarian regimes and their symbols in their founding documents. A report on the so-called ‘decommunization’ laws is due to be discussed at the 105th Plenary Session of the Council of Europe’s Venice Commission on Dec 18-19. Volodymyr Yavorsky, a member of the Ukrainian Helsinki Human Rights Union Board, expects the Venice Commission assessment to be negative. In his damning assessment of the law, he points out that the European Court of Human Rights is quite unequivocal with respect to dissolution of a political party. This must be on the basis of the party’s activities, not on its name or symbols. They must be proven activities. During the press conference in July, Oleksandr Turchynov, head of Ukraine’s National Security and Defence Council, spoke of the crimes committed by the Soviet Communist Party, and then asserted that from the first days of Russian aggression, the Communist Party had acted like a fifth column and had supported and abetted Russia’s occupation of Crimea and the invasion of Russian forces in the east of Ukraine. He claimed that material “confirming the criminal activities of the Communist Party against its own country” had been collected and passed to the court. However, he continued, the court, “as you know”, needs radical reform and 100-percent renewal, and the court case was dragging on. The European Court of Human Rights has a detailed explanation of its position as regards political parties and associations. It cites Article 11 of the European Convention which allows for restrictions on freedom of association only where these “are prescribed by law and are necessary in a democratic society in the interests of national security or public safety, for the prevention of disorder or crime, for the protection of health or morals or for the protection of the rights and freedoms of others”. The Justice Ministry both in July and now bases its actions in seeking the ban on a law which outlaws communist party names and symbols. The Court in Strasbourg found back in 1998 that the ban on the United Communist Party of Turkey had been in breach of the Convention. “In the absence of any concrete evidence to show that in choosing to call itself “communist”, the TBKP had opted for a policy that represented a real threat to Turkish society or the Turkish State, the Court could not accept that the submission based on the party’s name might, by itself, entail the party’s dissolution”. It may well be that the SBU can prove that there is a need in democratic Ukraine to ban the Communist Party on the grounds of danger to national security. Neither it nor the Justice Ministry have thus far done so. Instead the Ministry has invoked a law which does the same as laws in other countries found in violation of the Convention, while also resorting to populist rhetoric about the crimes of the communist regime. The latter are not in question, but they will not be seen as extenuating circumstances if Ukraine is found to have banned political parties without providing compelling evidence of the need.